"A clear horizon—nothing to worry about on your plate...only things that are creative and not destructive within yourself. Within me I can't bear quarreling. I can't bear feelings between people. I think hatred is wasted energy...and it's all non-productive. I'm very sensitive. A sharp word, said, by say, a person who has a temper—if they're close to me—hurts me for days." - Alfred Hitchcock, when asked for his definition of "happiness." If I were to plot two points and draw a straight line in order to determine from whence I got here today, the first would designate my first viewing of Strangers On A Train by Alfred Hitchcock in a Seventh Grade English / Film Appreciation class (Actually my poor riddled brain just can't remember what the heck that class was called!!) Hitch's use of black and white, shadowing, his outlandish angles, his technique for building tension (and the art of the McGuffin), and most of all the incredible shot of the strangling seen by reflection from the fallen glasses of the victim (played by his daughter, Patricia) all became eternally etched into my mind. I was caught—hook, line, sinker and red herring. Many of the world's most brilliant men do not interview well, becoming hesitant, reserved—even belligerent—but I am happy to report this is not the case with Hitch. On the other hand, if you are expecting the hammy, macabre and mischievous persona from his fabulously successful television series (heading into its 10th year at the time of this interview in 1964), you will be as shocked as if you had been watching Psycho. When asked to describe himself, Hitchcock says that he is "shy...not gregarious," that his wife and he lead a "quiet life"—and this is exactly what comes across. Here you will find a relaxed Hitchcock, able to easily quip about his well-known hatred for actors ("Walt Disney has it right, where actors are concerned...if he doesn't like the actor he just tears them up!") as he is to answer earnestly about the use of color or whether he sees himself as the Anglo-American press do (as an entertainer) or as the French press do (as a Catholic moralist). Despite the (befitting) melodramatic presentation, this interview, originally aired in two half-hour segments on the CBS television show, Telescope, is an effective and expansive testimony to Hitch's vision, artistry and catalogue. The one "hitch' is that I could not help but chuckle at the awkward shots of interviewer Fletcher Markle nodding his head, smiling amusedly or mocking sincerity, which were obviously shot afterwards, as the film quality does not match at all. 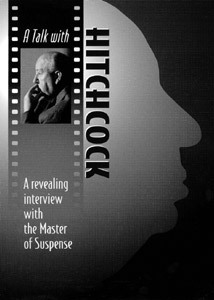 The questions however are mostly astute and focused, leading Hitchcock from his humble beginnings as a designer and writer of silent film titles, to his "accidental" start as a director (The Lodger), through to his latest release (at the time), Marnie. Hitch speaks of being more interested in the art of filmmaking than the film's content, as a painter who loses himself in the technique rather than the subject might. We learn that he considers Shadow Of A Doubt (1942) his best film, and that he was forced to change the ending of Suspicion (which sounds superior the way he describes it), because he made the "mistake" of hiring Cary Grant, who would not allow himself to be the bad guy for fear of his public persona. Before a short discussion with Bernard Herrmann (it is unclear whether he is in the room or not), Fletcher Markle asks Hitch what he thinks of music, to which he replies, "music is very good, especially when it's needed for silence." Image Transfer Review: As I mentioned, you can tell that the interviewee footage is from a different stock (or source) than the interviewer footage, which unfortunately is far cleaner, less grainy and of all around better contrast. The interview is accompanied by complementary black-and-white clips from several movies (and one behind-the-scenes sequence) whether they were filmed in color or not, which are of various quality. There is quite a bit of footage from The Birds, and it wasn't until I saw this that I finally realized why I was so ill at ease with the recent Universal Studios release of the renovated version of the movie: I had never seen it in color before! It has been probably 20 years or more since I last saw it, and back then I only had a black-and-white television! Do they even sell these anymore? To end my digression, the graininess is disappointing, but this is a source issue. Audio Transfer Review: If you are expecting much from this Dolby Digital Mono transfer, you should turn around and click a different link. The audio shows its age with some hissing and slight garbling, but the dialogue is generally audible and understandable. The worst of it can be evidenced in the section surrounding Mr. Herrmann's appearance where both his and Hitch's speech are so garbled you'd think they were gargling. Extras Review: This is the plainest of Plain Jane discs, containing only a scene access menu—and that's only if you hit the Menu button, because the interview starts automatically from the get go. A Minimum Zinneman filmography would have been nice. Forget the lack of extras. Forget the clean but grainy image, and the imperfect audio. This is a fascinating look at one of our greatest artists, presented in a congenial and comfortable manner. When he speaks I remember why I am here. This is not only a MUST HAVE for Hitchcock enthusiasts, completists and film students, but an important document of the inner workings of the mind of an amiable genius. Highly recommended.